KATHMANDU, Aug 26: Remittance growth rebounded in the last Fiscal Year 2017/18 despite continuous fall in the number of Nepali workers heading for foreign employment. According to the data of Nepal Rastra Bank (NRB), the country received a total of Rs 755.06 billion in remittances in FY 2017/18 which is up by 8.6 percent from the previous year. 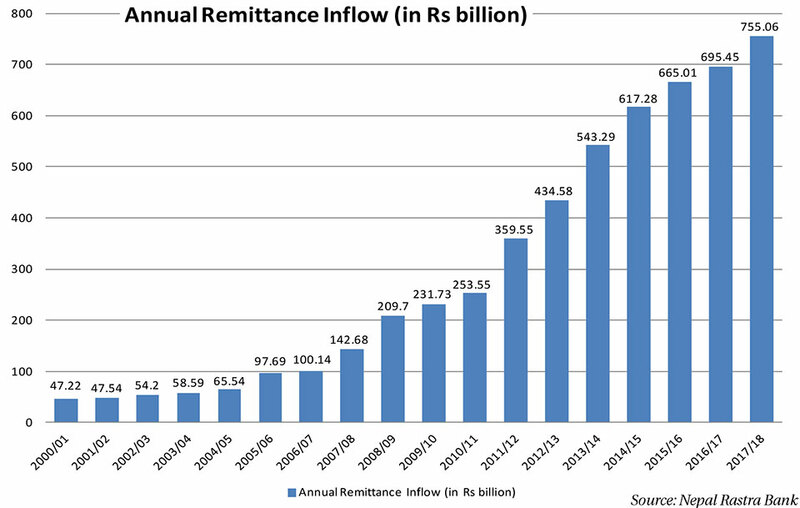 In FY 2016/17, the remittances had risen 4.6 percent to Rs 695.45 billion. The decelerating growth rate of the remittances had become a major concern for the government, policymakers and bankers, among other stakeholders. While the growth rate of workers’ transfer has gone up, the number of workers going abroad for employment continued to take a dive in the last fiscal year. According to the data of Department of Foreign Employment (DoFE) that was compiled by the NRB, the number of Nepali workers seeking foreign employment, based on labor approval, fell further by 10.1 percent in the last fiscal year compared to a decline of 4.7 percent in the previous year. A total of 358,815 workers received work permit from the DoFE in the last fiscal year, down from 398,978 workers who acquired the work permit to move abroad in search of employment. While the number of workers was already on a declining trend, recent problems seen in Malaysia led to further fall. The government has currently stopped sending workers to Malaysia amid news reports about exploitation during the recruitment process. However, the rise in remittance is attributed to the appreciation of the value of US dollar as well as recovery in the oil price in the international market. “The appreciation of the US dollar in the recent months has worked like an incentive for workers. With the value of the dollar going up, which in turn also raised their actual saving, workers are tempted to send their money back home,” said Nara Bahadur Thapa, executive director at the NRB. “Another major factor is the recovery in the oil price in the international market. Since most of the Gulf countries where there are majority of Nepali workers rely on oil revenue, their economic activities gained momentum with the rise in oil price. They hire more workers and provide higher wages,” added Thapa, who also heads the Research Department of the NRB. Central bank officers say that the growing use of banking and formal channels by the workers to remit their money has also helped to increase the remittance data. They say that some institutional set up by Nepali banking institutions and remittance companies in labor-receiving countries like Japan has helped to properly channelize remittances to the country. Bhisma Raj Dhungana, the chief of the Foreign Exchange Department of the NRB, told Republica that the increase of transfer of money by workers in South Korea through banking and formal channels in recent months has also contributed to the growth in the remittances. “Earlier, Nepali workers in South Korea used to face hassles to transfer their earning to Nepal. But, there has been a new mechanism introduced there recently, allowing remittance companies to transfer remittances in bulk. This has made it convenient and cheaper for the workers to send their money back home,” he said. “The growing use of formal channel in this labor destination is reflected in the increasing annual remittance figure,” he added. NRB officials estimate that over Rs 40 billion used to flow inside the country from South Korea through informal or illegal channels like Hundi. However, the share of remittance arriving through such informal channels fell in the last fiscal year, according to Dhungana. 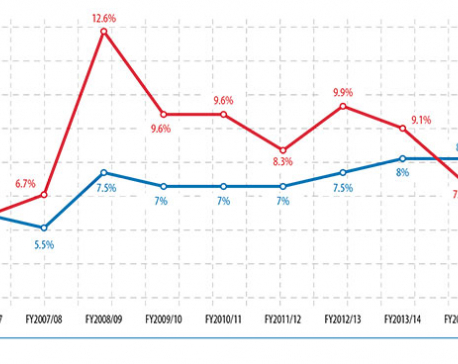 KATHMANDU, Aug 22: The annual average inflation dropped to a 14-year low of 4.2 percent in the last fiscal year.